This may come as a surprise,but according to the California Budget & Policy Center, approximately 40% of college students experience food insecurity. College students are not usually the first group we think of when we are talking about hunger in America, however the steady increase in housing costs has outpaced increases in student aid by a large margin over the last 10 years. This puts pressure on students who have limited financial means to make compromises on both food and housing decisions. The California Budget & Policy Center reports that "Food and housing insecurity among college students are associated with poor health and mental health symptoms such as depression and anxiety." To help address the hunger issue on college campuses, each of the 23 California State Universities has set up a student food pantry or food distribution program on campus. 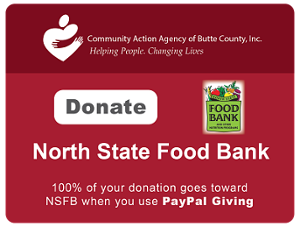 Here in Chico, Butte CAA supports the Hungry Wildcat Food Pantry at Chico State, through a partnership with our North State Food Bank. This collaborative effort helped feed 4,000 students over the last school year. What Action Can You Take in Your Community? Every month the North State Food Bank serves an average of 45,000 hungry residents in the six-county region. We partner with great volunteers and food providers to make this happen, but your financial donations also make a huge impact. Our annual goal is $150,000 of community support. Together we can take care of our community and make sure nobody goes hungry. Our seasonal produce giveaways – calendar and locations can be found on our website. We will accommodate our volunteers comfort level. Call us at 530-712-2600, Option 3 to see how you can help. 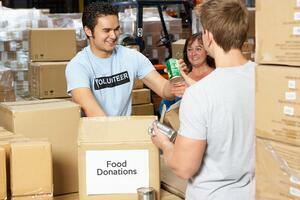 Partner with the North State Food Bank to hold a food drive at your business or event. We can help you with organization and promotion and it's a great way for a local business to get involved in the community and give back! Call us at 530-712-2600, Option 3 to discuss the possibilities.